1) Select the order that you want to ship. 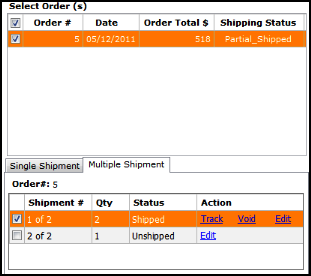 2) Then click the Multiple Shipments tab in the order detail area. Then click Edit to choose the quantity of items that are to be partially shipped in the current shipment. 3) The item quantity to be shipped can be increased or decreased. If the quantity in shipment is less than the total quantity of an item in an order, the remaining quantity is automatically added to the quantity remaining to ship box. Click Save & Close when finished. 4) The quantity that is ready to ship is automatically in shipment 1 and the status is set to Items Ready. The quantity remaining to ship is automatically assigned the following shipment. The quantity of items ready to ship can always be edited from this area. 5) The shipping parameters can be chosen to ship the first shipment. Then click Save Shipment and the status for the selected shipment will be set to Ready to Ship. 6) Click on Ship in the Action area of multiple shipments tab or Generate Label at the bottom of the shipping module, to print the label. The status is now Partial Shipped the remaining shipments can be shipped at a later date. Note: If there are remaining items, additional shipments will be automatically created in this area each time. This process is repeated until all items in an order have been shipped.